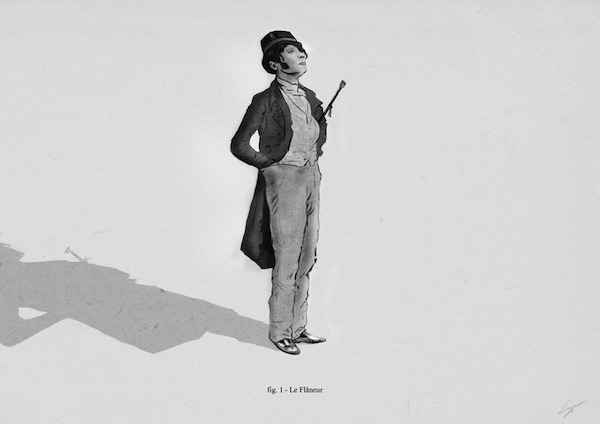 No one wants to be a flâneur anymore. It sounds too dandy, too affected. Even if the idea of strolling around a (probably European) city, thinking deeply about how it engages with its people spiritually and aesthetically, sounds dope–no one respects a guy who would call himself a flâneur (he probably has a men’s style blog). But everyone respects flannels. (The two words are not related but should be.) Gray flannels are swiss army knife pants, wearable in a pinch on nearly any occasion between jeans and formalwear, and great looking in any of those contexts. Made from wool twill that’s slightly napped and fuzzy, they can go multiple wears without needing a press or cleaning, and in temperate climates can be worn 9 months per year. They pair well with nearly any jacket fabric, much more so than navy wool pants, which are too dark for lighter fabrics and which never look right with plain blue jackets. For many of us, gray flannels were our first grown-up trousers. A true flâneur wouldn’t wear foppish finery, he’d wear flannels. Like with shoes, there’s not a lot to recommend under $200–even J. Crew and Brooks Brothers charge >$200 for gray flannels these days. There are bargains here and there but you should expect to pay at least that much for a well-made pair of dress trousers in a workhorse gray flannel that has the natural wrinkle resistance and texture of good wool. The “on paper” details on these trousers are largely the same (with the slight exception of Berg and Berg)–they are flat front, wool flannel trousers with typical dress trouser features: curtained, split waistbands; lining to the knee; off seam pockets; and zipper fly. But the maker, fabric, and cut varied on each, as did the vibe. Epaulet Walt ($97.50 on sale from $195): Making slim, affordable versions of archetypical men’s items is Epaulet’s lane, and the Walt trousers are no exception. The most aggressively slim cut I tried this round, Epaulet’s pants are quite flattering—the waist measured pretty true on my size 36 trousers and tapered to 8 inches across at the hem. The Vitale Barberis flannel Epaulet used in this version is on the lighter side of mid gray: just about perfect for odd trousers. The fabric felt a little lighter than on the other pants I tried, and given the cut it didn’t drape quite as cleanly, but that’s not what these pants are about. You won’t likely find pants styled like the Walts outside of Italian companies like Boglioli or Incotex, and the Epaulets are a better value. 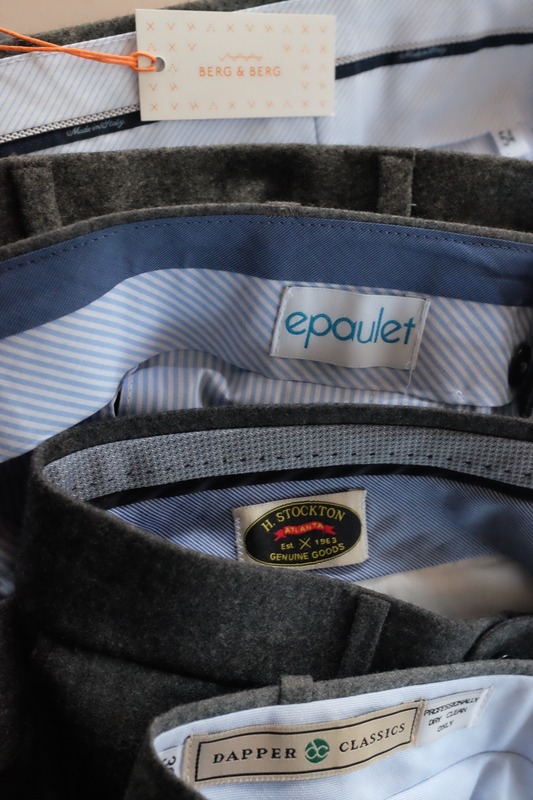 Epaulet makes these pants in Portugal, and they were finished well, although not quite as finely as some of the other pants in this review. They don’t cut corners on features, though–they have a split waistband (helps with tailoring and allows a little give), are lined to the knee, finished/covered interior, seams, and feature a button and slide closure and zip fly. These were also the only trousers I tried that arrived with a finished hem, with about a 34-inch inseam–plenty for most guys but maybe not everyone. H. Stockton regular fit trousers ($225): H. Stockton is a traditional men’s clothier in Atlanta and these trousers are a good example of why traditional works. Made in Canada, they’re the fullest cut I tried and they drape beautifully–in part due to the wool/cashmere blend of their flannel fabric, which felt best among the trousers I tried. Like the other trousers here, they are lined to the knee and hems are left unfinished, with a 37-inch inseam, so plenty of fabric to cuff if you choose to do so (I would; the additional weight at the cuff would make the fabric fall even more nicely). The rise is middle of the road–definitely not low-rise but not conspicuously high either–I think these would meet Derek’s criteria well for eliminating the dreaded “shirt triangle” common with low-rise trousers. If you like fuller proportions in your tailoring, H. Stockton’s cut would suit you. Dapper Classics slim and classic flannel trousers ($245): I tried both Dapper Classics slim and classic cuts, and their slim trousers were my personal favorite of the selection here. The cut of their classic fit is similar to the H. Stockton cut–full but not baggy, with room in the waist, seat, and legs (most of the pants I tried in size 36US and nearly all trousers measure a little larger in the waist than tagged; most of these had waist measurements around 37–Dapper Classics classic fit was closer to 38. Of course these can be tailored relatively easily and you’ll need to alter the hems anyway). I found the slims to be ideal for my preferences for trousers right now. The rise was a little lower than the traditional cuts but not constricting or hip-slung, the tapered cut through the legs allowed fabric to drape nicely but was cut close enough to give me some shape, tapering to an 8.5 inch hem. With my build, I think hem widths of 9+ inches are less flattering, although they have their place. 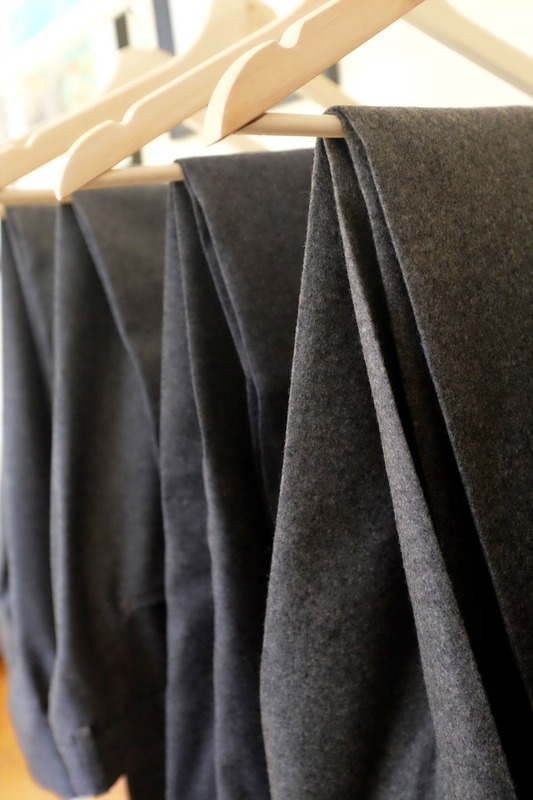 The fabric has a good hand and color–it’s truly mid-weight and mid-gray, which doesn’t sound exciting except you’d be hard pressed to find a wool jacket these wouldn’t look great with. At $245, they are a little pricier than the other options here, but I still think a good value in a world where Italian ready-to-wear trousers like Incotex are pushing $400/pair at retail. Berg and Berg Alfred trousers ($196, currently out of stock, shown in navy): Berg and Berg is a bit of a wild card here, as I tried out their pleated flannel Alfred trousers, which aim to deliver styling details less often found in current ready-to-wear trousers. These are a higher rise, single pleated, tapered trouser made in Italy, and not so much in the American, trad-influenced tradition. I liked them a lot, though, and for around $200, you won’t find a lot of similar trousers out there. Most American companies that are doing pleated trousers still cut them quite large, with shoe-swallowing hems. Berg and Berg’s trousers’ trim single pleat and taper lead to a really clean line from waist to hem that’s quite flattering. Flat front flannels are a true essential, but if you already have a couple of pairs Berg and Berg’s trousers would be a nice way to branch into different, forward looking styling for trousers, and at a pretty tremendous price. After spending some time handling and trying on a whole lot of gray flannel trousers, I’m happy to conclude that all of these are worth the money you pay and would be a solid addition to your closet whether they’re your first pair of gray flannels or your tenth. If I were to pick one, I’d give a slight edge to Dapper Classics’s slim fit, which happened to fit my body quite well and strike the right balance for me among flattery, classic proportions, fabric, and price.